An Introduction to Advanced Quantum Physics presents important concepts from classical mechanics, electricity and magnetism, statistical physics, and quantum physics brought together to discuss the interaction of radiation and matter, selection rules, symmetries and conservation laws, scattering, relativistic quantum mechanics, apparent paradoxes, elementary quantum field theory, electromagnetic and weak interactions, and much more. Each chapter concludes with problems to challenge the students’ understanding of the material. This text is intended for graduate and ambitious undergraduate students in physics, material sciences, and related disciplines. Professor Hans Paar has been on the faculty of the University of California San Diego since 1986. 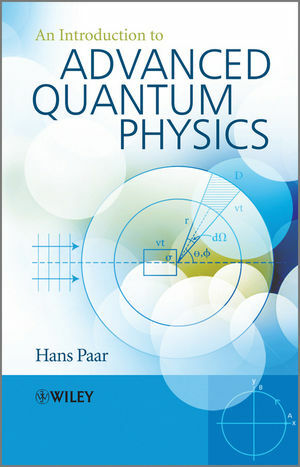 He has taught Quantum Physics in all four quarters it is offered at the undergraduate level and has developed and taught the third and fourth quarter of this course (which corresponds to the content of the book) almost each of those 22 years. He has been vice-chair education in UCSD's Physics Department from 1992-1999 and again from 2008-present. Professor Paar is an experimental particle-astrophysicist and has spent nearly 20 years in experimental high energy physics (particle physics by another name) and nearly three years in Cosmology (the Big-Bang and the particle physics of that era). I am an author on 938 publications. The book limits itself to those topics that are absolutely necessary for understanding elementary particle physics and condensed matter. Important concepts from classical mechanics, electricity and magnetism, statistical physics, and quantum physics are pulled together to discuss the interaction of radiation and matter, selection rules, symmetries and conservation laws, scattering, relativistic quantum mechanics, and more. Includes problems within the text and solutions on the author’s website.